Cleanse Uninstaller Pro 10, Uninstall any program now! 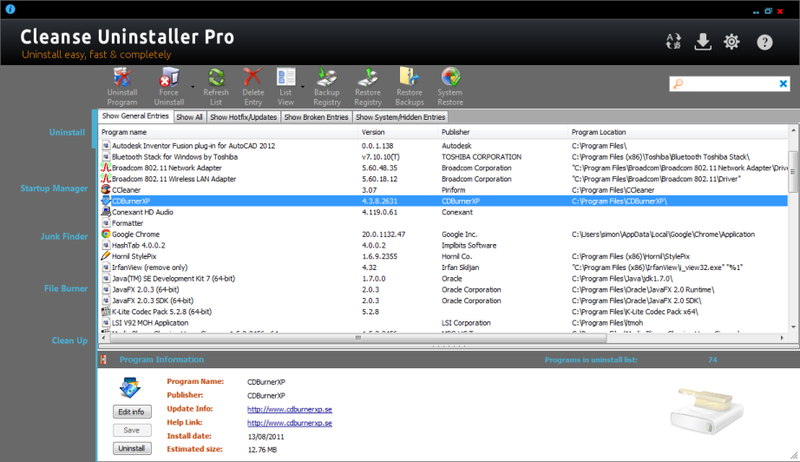 Cleanse Uninstaller Pro 10 was available as a giveaway on August 2, 2012! Cleanse Uninstaller Pro is an advanced uninstaller that finds and removes even the most stubborn software. Uninstall faster, easier and more completely than you do with other programs. Using the Auto Find uninstall software function all you have to do is drag and drop the program icon you want to uninstall onto Cleanse Uninstallers icon and Cleanse will Auto Find the program in the uninstall list and start the advanced uninstall process. Cleanse Uninstaller will try to find any left over files or registry entries (often left behind causing clogs which slow your computer) and help to remove all of the remaining traces to optimize your computer’s performance. Cleanse Uninstaller also includes a startup optimizer to make your computer boot faster. 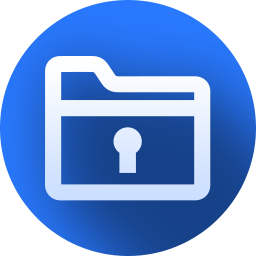 You can reclaim the disc space with Junk file search and remove function. Uninstall any program now with Cleanse Uninstaller Pro 10! How would you improve Cleanse Uninstaller Pro 10? Make it auto refresh instead of manual refresh, when program is uninstalled. not have to drag and drop programs to delete- this is double managing when there are similiar apps i.e. iobit that does 99%of the work! and it is free as well as using ccleaner free as well! i do not think paying for the aggro is worth it! Is there anyone that can let me know if any uninstaller ever removed ALL files from software being removed. I use the free Everything for searching my PC quickly. I have used most uninstallers. And have always had 4,6,8 or more leftover files on my computer. Even though they claim to remove all leftover files. Cleanse Uninstaller Pro has a few problems, some inconsequential and others not. Most pertain to the GUI layout. The Analyze function initiated before the GUI comes up is forced ( ie. can't toggle it off in settings ) and takes quite a bit of time & resources to finish. This lengthy time appears to be just the first run and takes considerable less on subsequent loads. FYI: This analysis time is excruciating when run as a portable, so I would not recommend this for those with out considerable patience! The GUI;	I'm not one who is overly picky about the appearance, but the layout takes a lot more space then is necessary, leaving less room for the pertinent information. The larger than necessary button Icons @ the top could be smaller and their texts should be switched on/off in the settings. There is a hover function, but the pink background makes the medium gray text unreadable. The button bar, list and information windows go off the GUI on the right with no way to see them. Most importantly the info window is vertically truncated and the information in it can not be seen making it useless. There are no scroll bars visible but are definitely needed. The list item context menu comes up with the same functions even if you are not selecting an item. dangerous as an Uninstaller / Cleaner. Pros;	I like the matrix layout of the functions, it's logical and makes sense to me. The analysis picked up numerous items that most other programs miss, even those with a trace install function. Most of these I suspected existed or can understand why, do to my frequent and perhaps excessive manual manipulations of my file structure, software sub functions and the registry. opportunity to try it again, when it nears the end of it's Beta stage. This message is directed at all the folks that are saying Revo Uninstaller doesn't work with Win 7 64 bit. Not so. I too have the 'Ultimate' version and have been running it for two years on my present system. (I installed RI as one of the first half dozen programs, before I upgraded and installing XP Mode.) I've used Revo (present version 1.94) for somewhere close to 20 years on three, or four different computers and have always found it to do an excellent job. I've never had any problems with it on my 64 bit systems. thanks for the offer but i dont think i will be trying this one.i got enough uninstallers on my machine.used to use revo but now using advanced uninstaller pro as mentioned by giovanni see #7 for link. got a few more tools with it.wont mention them here,try it for yourself if you dont want this one. I think it's entirely possible that I have tried 95% of the 'uninstallers' out there and I can authoritatively say that NOT ONE of them works 100% of the time to remove 100% of the files, settings and registry info from programs, EVEN IF MONITORED. Some (Revo, Total Uninstall just to name two) are beter than most, but I have registered copies of both and they don't remove everything everytime; they just don't. That said, I'm not really willing to trust that a $20 program will do what $30 and $40 programs can't. It just doesn't logically follow. You of course can (and should) give this giveaway a try to see how well it works. Here's a simple test. Install a 30-day trial version of a program according to the uninstaller's instructions, wait a couple days when the trial has 28 days left, use the uninstaller to remove the trial program, then install the trial again, if the trial time doesn't reset to 30 days remaining then the uninstaller simply didn't work. I think it's entirely possible that I have tried 95% of the 'uninstallers' out there and I can authoritatively say that NOT ONE of them works 100% of the time to remove 100% of the files, settings and registry info from programs, EVEN IF MONITORED. Some (Revo, Total Uninstall just to name two) are beter than most, but I have registered copies of both and they don't remove everything everytime; they just don't. That said, I'm not really willing to trust that a $20 program will do what $30 and $40 programs can't. It just doesn't logically follow. You of course can (and should) give this giveaway a try to see how well it works. Here's a simple test. Install a 30-day trial version of a program according to the uninstaller's instructions, wait a couple days when the trial has 28 days left, use the uninstaller to remove the trial program, then install the trial again, if the trial time doesn't reset to 30 days remaining then the uninstaller simply didn't work. re #26: Joe, yes you can use the freeware version of Revo on Win7 64bit computers but it only detects and uninstalls 32bit programs. If you want to use it to uninstall 64bit programs you will need to upgrade to the paid version. The right edge was cut off for me, too. The developer might want to take note of this. I just downloaded the program, looks good. Can't wait to try it. Thanks to Zards and GOTD. The program does work wonderful as intended but the program does not enable to automatically backup the changes before you proceed to do something. If you don't know how to do a system restore on your computer, I suggest you visit the Microsoft website, and they will show you step by step on how to create a restore point. Program does come in handy though for those programs that don't fully remove something by default. The program does work wonderful as intended but the program does not enable to automatically backup the changes before you proceed to do something. If you don't know how to do a system restore on your computer, I suggest you visit the Microsoft website, and they will show you step by step on how to create a restore point. Program does come in handy though for those programs that don't fully remove something by default. My last boss is red-green colorblind, which means both new and broken entries would appear as kinda grayish for him. Please try another color scheme and use something else to indicate the difference. “Entries in the uninstall list are color coded to highlight the type of entry, black entries are normal, green are new and red are broken entries.” My last boss is red-green colorblind, which means both new and broken entries would appear as kinda grayish for him. Please try another color scheme and use something else to indicate the difference. Make the third screen look more professional by using "leftover" instead of "left over". @31 -more- and in fact the content of the folder was deleted, but not the then empty folder itself..
@4 I was interested in the detection of broken entries. I have a hundred+ programs installed, and about 15 were listed as broken, of which about 5 proved to be registry remnants. One included a folder of leftovers- about 150Mb. Unhandled exception has occurred in your application. If you click Continue, the application will ignore this error and attempt to continue. If you click Quit, the application will close immediatery. See the end of this message for détails on invoking just-in-time (JIT) debugging instead of this dialog box. System. 10.10Exception: The directory is not empty. #26.... Where are you people getting this from? I run Revo on several x64 systems. It runs fine! Funnily enough, from the official REVO Website, which I've re-checked and that info has not changed. Sure you know what you are using? Anyway, good luck! In case anyone is considering purchasing Total Uninstall, although it is a great uninstaller, if you do decide to purchase then be prepared to pay full price when there is a version upgrade like from 7.6 to 8.0. Happened to me and not even a discount for current users. Best uninstallers take a "snapshot" of system before and then after you install it and run it once with no other programs running in background while installing. Only one I know of that will allow you to uninstall if there is a crash or BSOD during installation is AShampoo because you can find the before and after files it creates and continue as if a reboot was required. I have used this app for years and lost it-- glad I can get it back for free here. It has a better GUI than the Revo I am currently using. It has the best Force Uninstall I know of -- it will uninstall just about anything you enter in the Force box. I suggest that you try it. I have used this app for years and lost it-- glad I can get it back for free here. It has a better GUI than the Revo I am currently using. It has the best Force Uninstall I know of -- it will uninstall just about anything you enter in the Force box. I suggest that you try it. regarding #16. I also use Ashampoo’s Uninstaller because it works for Windows 64. It is frequently heavily discounted. It is slower than many programs because it first takes a complete picture of your system before an install and then you create a log file after the install. Also If you choose you have some options of what not to uninstall. I continue to use it because I have not had problems with it screwing up my system with improper uninstalls and it is more thorough than most others I have tried that are free. regarding #16. I also use Ashampoo’s Uninstaller because it works for Windows 64. It is frequently heavily discounted. It is slower than many programs because it first takes a complete picture of your system before an install and then you create a log file after the install. Also If you choose you have some options of what not to uninstall. I continue to use it because I have not had problems with it screwing up my system with improper uninstalls and it is more thorough than most others I have tried that are free. Same problem. Only 4/5ths of screen. Revo (freeware) is a good competitor. Some claim that their choice of uninstaller removes ALL of the software fragments. This is wishful thinking. If you use a freeware called RegSeeker to search for fragments of your just-uninstalled program in the registry, you may be in for a shock. Try this after uninstalling Real Player and see for yourself. Same problem. Only 4/5ths of screen. Revo (freeware) is a good competitor. Some claim that their choice of uninstaller removes ALL of the software fragments. This is wishful thinking. If you use a freeware called RegSeeker to search for fragments of your just-uninstalled program in the registry, you may be in for a shock. Try this after uninstalling Real Player and see for yourself. "Just one rider to comments so far: Revo Uninstaller Free is only for 32 bit systems. If you have 64 bit, then you need to buy the Pro Version or move on to something else." Where are you people getting this from? I run Revo on several x64 systems. It runs fine! <strong>"Just one rider to comments so far: Revo Uninstaller Free is only for 32 bit systems. If you have 64 bit, then you need to buy the Pro Version or move on to something else. "</strong> &nbsp; Where are you people getting this from? I run Revo on several x64 systems. It runs fine! Some people here claim to use Ccleaner as an uninstaller with good results. Ccleaner isn't an uninstaller and doesn't have an uninstaller built in. When we use Ccleaner to uninstall a certain program, it runs the uninstaller that comes with this program. Some people here claim to use Ccleaner as an uninstaller with good results. Ccleaner isn't an uninstaller and doesn't have an uninstaller built in. When we use Ccleaner to uninstall a certain program, it runs the uninstaller that comes with this program. "I started using Geek Uninstaller because Revo free would not find my 7(64) programs. Does anyone know if that has been changed?" The issue is with your computer. I run Win 7 Ultimate x64 and use Revo daily. I have also used it with Win 7 Pro x64. <strong>"I started using Geek Uninstaller because Revo free would not find my 7(64) programs. Does anyone know if that has been changed? "</strong> &nbsp; The issue is with your computer. I run Win 7 Ultimate x64 and use Revo daily. I have also used it with Win 7 Pro x64. Advanced Uninstaller free has always done the job for me and have never felt the need to use anything else. The GUI looks like it should be on a Windows 95 machine, not my Windows 7 computer!! Marketing feedback: since you are up against serious competition, a more up-to-date look would help. Better 3D buttons, nicer rules/borders, etc. I would work on the GUI until it looks as if it would be worth $20. Personally, after trying REVO I bought the PRO version and haven't looked back, it runs to perfection, and that's your competition. Try to make a better visual first impression. "The interface looks rather primitive"
I must say I disagree, it's rather stylish (CCleaner-like layout) and actually looks less 'primitive' (e.g. native OS) than say Revo Uninstaller. I'll use Revo as comparison. Installed without problems, simple procedure without any bloatware. Says it supports 64-bit on their site, but installer gave me a 32-bit version nevertheless. Oh well. Like I said, clean and effective interface. Gives a nice tabbed overview of all different categories of software. Starts with all entries in the general tab, switching back and forth between tabs fixes this small bug. Creating Restore Points and registry-backup arn't enabled by default, so make sure to enable them if necessary in the Settings window. You will be asked to backup the registry etc. but Restore Point is skipped unless you enable it. Uninstall procedure is otherwise similar to Revo. First it runs the applications uninstaller, which triggered Avasts Sandbox, that never happened with Revo. Small annoyance but not something to get all worked up about. Then it scans for both leftover registry entries and files. The progress window freezes, but comes back when scanning is finished. Quite fast scanning I must say, faster than Revo. It did the job well and without hiccups, but doesn't offer anything extra compared to Revo. I wouldn't buy it personally, but that's not because it's not worth it or of the freeware alternatives. I usually install with Sandboxie or Time Freeze, which gives me the control I want when I want it. If I still want to uninstall afterwards however, this would be a good program to use. Thanks GOTD and Zards software. It's a keeper this time. However, I got a tip for Zards software: I was able to verify some links (Brothersoft, Softpedia (really old version 2.9), X 64-bit Downloads, Frostapps and PC Welt (site search results)) but to make it easier for potential customers, or rather to attract more real customers, link your badges and awards to the corresponding articles. There's no greater turndown than a non-existing badge or award. This program activated and installed okay, but did not display correctly on my screen. Could only see about 4/5 of the files, rest appeared off the screen. Never seen this before in any software I have installed. Another category of disputed program. Are they good or bad. They are neither good nor bad. For those who do computer backup and restore on a regular basis, this may be less valuable. For those who do not know how to make a backup yourself, this could be more valuable. Personally, I do backup with Macrium. When the computer is freaking out I restore the backup. Make any updates. Adds new programs, if necessary. Then a new backup. Some will say that the backup is safe to 100%. In theory, it is true, but the actual handling of backup and recovery matters to. Another category of disputed program. Are they good or bad. They are neither good nor bad. For those who do computer backup and restore on a regular basis, this may be less valuable. For those who do not know how to make a backup yourself, this could be more valuable. Personally, I do backup with Macrium. When the computer is freaking out I restore the backup. Make any updates. Adds new programs, if necessary. Then a new backup. These programs do not clean as good as they say, and some cleaning things they have not talked about. As with any program that will do wonders under the hood of your PC, you have to take it with a grain of salt. Windows is a mystery when it comes to doing maintenance. This makes backup and recovery, in principle, the only thing that is at least safe to 75% Some will say that the backup is safe to 100%. In theory, it is true, but the actual handling of backup and recovery matters to. I started using Geek Uninstaller because Revo free would not find my 7(64) programs. Does anyone know if that has been changed? Just one rider to comments so far: Revo Uninstaller Free is only for 32 bit systems. If you have 64 bit, then you need to buy the Pro Version or move on to something else. Since I have Revo Free and "Your Uninstaller 7" (latter covers 64 bit) and was a freebie from GAOTD, I am covered. Oh, I also have Ashampoo's Uninstaller, but for once I admit that I do not like it - too complex, slow and heavy, compared to the others mentioned. [@ #10; Andrew - Ashampoo might be for you as it monitors installation and uninstall. Older versions might be free and newest will offer at least 30-40 days full trial use]. P S. Always ensure any uninstaller program creates a Restore Point ~ just in case. I'm sure that I am not the only one to see the BSOD after an uninstall! Just one rider to comments so far: Revo Uninstaller Free is only for 32 bit systems. If you have 64 bit, then you need to buy the Pro Version or move on to something else. Since I have Revo Free and "Your Uninstaller 7" (latter covers 64 bit) and was a freebie from GAOTD, I am covered. Oh, I also have Ashampoo's Uninstaller, but for once I admit that I do not like it - too complex, slow and heavy, compared to the others mentioned. [@ #10; Andrew - Ashampoo might be for you as it monitors installation and uninstall. Older versions might be free and newest will offer at least 30-40 days full trial use]. P S. Always ensure any uninstaller program creates a Restore Point ~ just in case. I'm sure that I am not the only one to see the <b>BSOD</b> after an uninstall! Unfortunately this prog is up against the Rolls Royce of uninstallers Revo Uninstaller, which offers a free version and various options of uninstall , including a manual removal of all traces of a prog in the registry. Not only that there are lots of other uninstallers out there , that are not as good as Revo. So why anyone would want to put a prog out that there that competes with the best , and competes with " free " defeats me. Perhaps they also offer another prog that pushes water up hill ? Unfortunately this prog is up against the Rolls Royce of uninstallers Revo Uninstaller, which offers a free version and various options of uninstall , including a manual removal of all traces of a prog in the registry. Not only that there are lots of other uninstallers out there , that are not as good as Revo. So why anyone would want to put a prog out that there that competes with the best , and competes with " free " defeats me. Perhaps they also offer another prog that pushes water up hill ? I had been using an older version (#8) and "upgraded" to the current offering. Started running it and discovered an old program I attempted to remove called Visual Site Designer by Coffee Cup. I tried "Uninstall" and "force uninstall" and found neither way able to uninstall the program. At this time I will be looking around for another un-installer. To bad, though the interface was called in an earlier comment "outdated", I enjoyed using it. I had been using an older version (#8) and "upgraded" to the current offering. Started running it and discovered an old program I attempted to remove called Visual Site Designer by Coffee Cup. I tried "Uninstall" and "force uninstall" and found neither way able to uninstall the program. At this time I will be looking around for another un-installer. To bad, though the interface was called in an earlier comment "outdated", I enjoyed using it. The program was able to remove fragments of old programs that other programs couldn't . It did fix those, so it is a good product. The interface looks rather primitive, so I would use it only as a back up to a more reputable program like Your Uninstaller or Revo Pro. Revo free edition among all the others already listed seem good enough. I can't get the activate.exe to activate the software. It says it will expire 01/09/2012: http://imgur.com/Fxh3D I still tried the program and was impressed with all of the features but was surprised to see how few registry entries it found: None found here: http://imgur.com/3n66O Just one found here: http://imgur.com/S8xGg There is no built in uninstaller. Why does it say "Use original uninstaller" if I have no choice: http://imgur.com/FkOLX Revo free edition among all the others already listed seem good enough. At first I liked the 'Activate.' It's usually a good sign. Twice, I installed the program, both times the right and bottom edges of the interface were missing. Both times I used IObit (Forced) Uninstaller to get rid of it. I will stay with my IObit toolbox, thanks. A good thing that I could test this in Sandboxie. Even Activate.exe ran in this sandbox. This is an easy install and registration process because an activate.exe file is included. The install is small and I really like the look of the program. It lists all of it's options in a way that is very uncluttered and easy to use. I installed a sample program and used this vs some of the other uninstall programs you can find on the net. It more than held it's own and in some cases did better. I would say if you are looking for this type of program, give it a try. This publisher has been a generous supporter of GAOTD over the years so their appearance here may not be limited to today. If one of their programs interests you, check back as you may see it offered here. Uninstallers may work well but i have found what works better for me is a program I got here, Wondershare Time Freeze. I turn on my system protection and install the program. If I like it I don't need to worry about the uninstall process. If I don't like it, I reboot my computer and everything is dumped. My computer is back to it's original condition. As always thank you goes to the GAOTD team for all you do for us. Thank you to the publisher, Zards Software, for your offering. This is an easy install and registration process because an activate.exe file is included. The install is small and I really like the look of the program. It lists all of it's options in a way that is very uncluttered and easy to use. I installed a sample program and used this vs some of the other uninstall programs you can find on the net. It more than held it's own and in some cases did better. I would say if you are looking for this type of program, give it a try. This publisher has been a generous supporter of GAOTD over the years so their appearance here may not be limited to today. If one of their programs interests you, check back as you may see it offered here. Uninstallers may work well but i have found what works better for me is a program I got here, Wondershare Time Freeze. I turn on my system protection and install the program. If I like it I don't need to worry about the uninstall process. If I don't like it, I reboot my computer and everything is dumped. My computer is back to it's original condition. As always thank you goes to the GAOTD team for all you do for us. Thank you to the publisher, Zards Software, for your offering. Yes this is super SATURATED NICHE now, meaning there's no need to pay anything for this kind of apps, as long as you know it of course...LOL! One of the few programs I paid for. Have used over 5 years with no problems. It uninstalls even the most stubborn programs, including registry. Without giving problems later to the user. I am installing today's program in rest of the home pcs which I could not afford to pay for. For info, I have a XP and Vista and Windows 7 operating systems on different pcs. I also have tried other uninstall programs- I have not seen one better, which why I paid for this.THANK YOU GOTD for this giveaway. Oh, one more thing--this feature: "Entries in the uninstall list are color coded to highlight the type of entry, black entries are normal, green are new and red are broken entries." wasn't accurate for me. Programs that had come installed with my laptop were listed as new, programs I'd installed two hours ago were listed as normal, and many programs I use regularly were listed as broken. As we all know there are many good uninstallers available including the best which is portable Revo uninstaller freeware and Ccleaner. Based on that I think the price should be lowered to $10. I am not going to install it because I have no way of verifying if the uninstall is complete. Also I do not like the drag and drop feature I prefer the program locate it for me. I think it is easier in this case. Not to disourage the buyers of paid version of software, but to prove that this uninstaller works 100 %. Can this software do that? Only if it can successfully reinstall a trial version of a software, it can claim to be better than the popular free version of Revo unistaller and many others... Not to disourage the buyers of paid version of software, but to prove that this uninstaller works 100 %. Can this software do that? Full Uninstall was offered a few weeks back. Is this uninstaller better than the Full Uninstaller?